Snelson Companies, Inc. opened it’s doors in 1946 as a small plumbing and heating business in Sedro-Woolley, WA. Frank Snelson, Sr. opened and ran the business with his three sons, Frank Jr., Jack and Bill. Bill Snelson, the youngest of the three, eventually took over for his father in 1957. His gutsy entrepreneurship, expert negotiation skills and ability to “come through in a pinch” quickly took Snelson, Inc. from a small family business to a diversified mechanical, pipeline and utility contractor. By 1966, Snelson was the 94th largest mechanical contracting firm in the U.S. 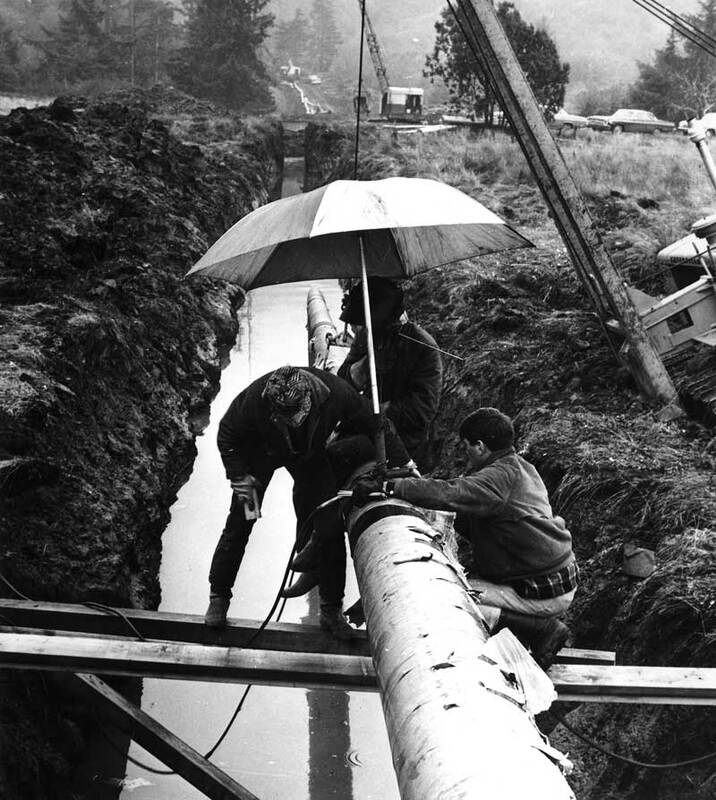 In the 1970’s, Snelson landed some of the largest projects on the Trans-Alaska Pipeline. For over a decade, Snelson joined forces with Anvil Corporation to construct refinery modules in Anacortes, WA – one of the largest fabrication yards on the West Coast. Once completed, these modules were barged up to Alaska’s North Slope and were then assembled in place to become fully functioning refineries. Shortly thereafter, Snelson was also involved in projects in Saudi Arabia and Lithuania; moving Snelson into the international sector as a pipeline company. Over the next 20 years, Snelson expanded their services by branching into industrial electrical, telecommunications, directional drilling, tank lifting, inspection and relocation services and refinery maintenance and capital projects. Since that time, some of these services branched off into individual companies of their own. While expanding, Snelson’s pipeline company stayed true to its roots – giving back to the community, maintaining integrity, and providing quality employment. Many of the employees who hired on during Snelson’s expansion in the 1970’s have stayed on – forming a core group that is the heart of the Snelson family today. In 1990, Bill Snelson sold his pipeline company to a group of individuals who were well established in the construction industry. In the mid-1990’s, Snelson was streamlined to specialize in the core services they had been providing for over 40 years – pipeline construction and maintenance, facility installations, pipe and structural fabrication services. In order to better serve our customers by expanding our geographic reach and building multi-spread and multi-facility capability, in 2008 Snelson was acquired by a substantial equity investor. This supported Snelson’s strategy of building a national pipeline construction and maintenance, facility installations, pipe and structural fabrication and gas distribution services company. Now proud to be a part of PLH Group, Snelson Companies, Inc., continues to move the company forward in the tradition of Bill Snelson – providing quality work and experienced people, serving the community with integrity and maintaining long term relationships with clients and employees alike.